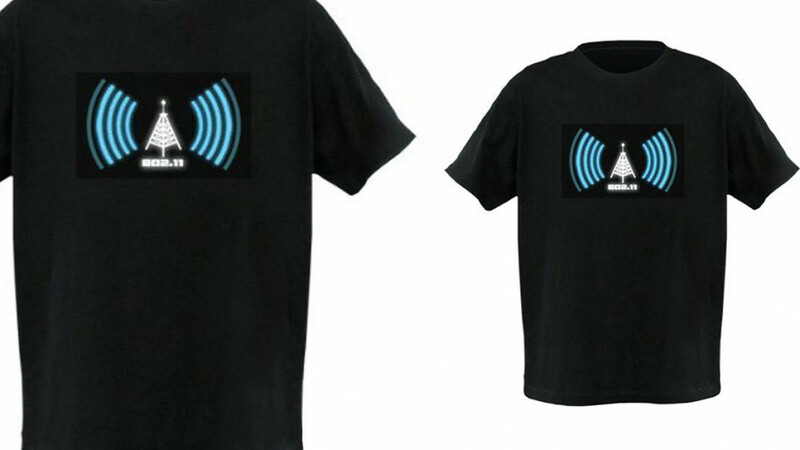 Glowing animated Geek Wi-Fi Detector Shirt dynamically displays the current wi-fi signal strength. The Wi-Fi detector shirt retails at around $30 and is capable of signal strength for 802.11b or 802.11g. This is a 100% cotton shirt and the Wi-Fi detector is powered by AAA batteries. The Wi-Fi detector part of the shirt is removable so that the shirt can be easily washed. It attaches via hook and loop fasteners. The battery pack is concealed in a small pocket inside the shirt so that the shirt is comfortable to wear. A cool novelty geek shirt for you or your favorite geek! Here are some reviews from people who have bought this shirt. They were so excited about it. They even came out with this new game "find the 10 best wifi spots..."
Fare price. Glad I got it." "We have used it at home and around town, and washed it according to directions, put in a drawer for a couple of years, took it out and it still works PERFECTLY !!!" "Love it very much!! I will recommend it to my friends. The price is very perfect. It deserves that. Thank you"